Dancing at a ceili at the Willy Clancy Summer School in Ireland. Welcome to the website for Irish Set Dancing in Canberra. Irish Set Dancing is fun, sociable and great exercise for the body and brain. It is a form of traditional dance featuring sets of eight dancers (four couples) dancing to traditional Irish folk tunes such as reels, jigs, polkas, slides and hornpipes. 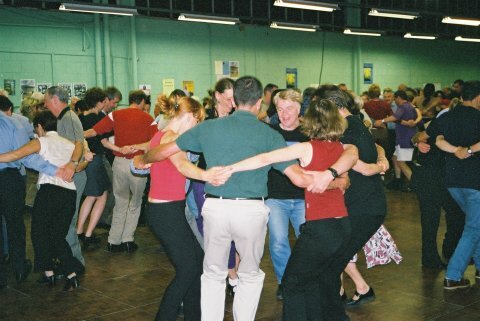 In Canberra we have weekly classes on Wednesday nights and an annual dance weekend. We also have occasional 'deck dances' and social get togethers. The Set in their Ways group displays at festivals and community events. We occasionally teach at other classes and events in Australia. We are part of the Monaro Folk Society which has a great program of complementary music and dance events. Please contact us for more information about any of our events or activities.